The Women’s Basketball Hall of Fame announced the Class of 2018 on ESPN2 during the telecast of the Louisville versus Connecticut game (7:00 p.m. ET). The members of the Class of 2018 are: Ceal Barry (coach), Dr. Rose Marie Battaglia (veteran, contributor), Chris Dailey (contributor – assistant coach), Mickie DeMoss (contributor – assistant coach), Chamique Holdsclaw (player), Katie Smith (player), and Tina Thompson (player). 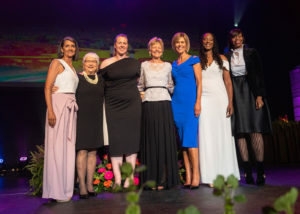 The 2018 Induction marked the 20th anniversary of the Women’s Basketball Hall of Fame, which held its grand opening and inaugural induction in 1999. The Class of 2018 were inducted into the Women’s Basketball Hall of Fame receiving their coveted Eastman Trophy and Baron Championship Induction Ring on June 9, 2018, in Knoxville, Tennessee. With the induction of the Class of 2018, the Hall of Fame has honored 164 inductees. All-time coaching record of 510-284 in 26 seasons with 12 NCAA tournament appearances, including six Sweet 16, and three Elite Eight appearances. Big Eight Coach of the Year four times (1989, 1993, 1994, 1995). 1994 U.S. Basketball Writers Association National Coach of the Year. NJCAA Hall of Fame inductee with four NJCAA Final Four in 38 years of coaching and an overall record of 702-240-2. Led Paramus Catholic High School (Paramus, New Jersey) to two consecutive state championships. 1998 WBCA Jostens-Berenson Lifetime Achievement Award recipient. Her overall record as an assistant coach is 845-207. As an assistant, she helped guide Tennessee to six NCAA National Championships and 12 NCAA Women’s Final Four appearances. Two-year stint as an assistant for the Indiana Fever including their 2012 WNBA Championship season. All-time leading scorer and rebounder at Tennessee, leading the Lady Vols to three NCAA National Championships (1996, 1997, 1998) and was recognized as a four-time Kodak/WBCA All-American and two-time WBCA NCAA Division I Player of the Year. Helped guide USA Basketball to a gold medal in the 2000 Olympic Games in Sydney. 1999 WNBA Rookie of the Year and a six-time WNBA All-Star. Three-time Olympic Games Gold Medalist (2000, 2004, 2008). Led Detroit Shock to two WNBA Championships in 2006 and 2008, and was named the 2008 WNBA Finals MVP. Two-time Kodak/WBCA All-American (1993 & 1996) and Big Ten Player of the Year (1996) while at Ohio State. First professional women’s basketball league in the United States, playing three seasons from 1978-1981. The league was created by sports promoter Bill Byrne and featured eight teams during its inaugural season. 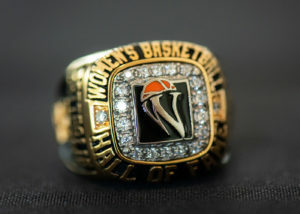 Many notable Women’s Basketball Hall of Fame inductees participated in the WBL including Carol Blazejowski, Cindy Brogdon, Nancy Dunkle, Peggie Gillom-Granderson, Lusia Harris Stewart, Tara Heiss, Nancy Lieberman, Muffet McGraw, Ann Meyers Drysdale, Pearl Moore, Inge Nissen, Patricia Roberts, Rosie Walker, and Holly Warlick.